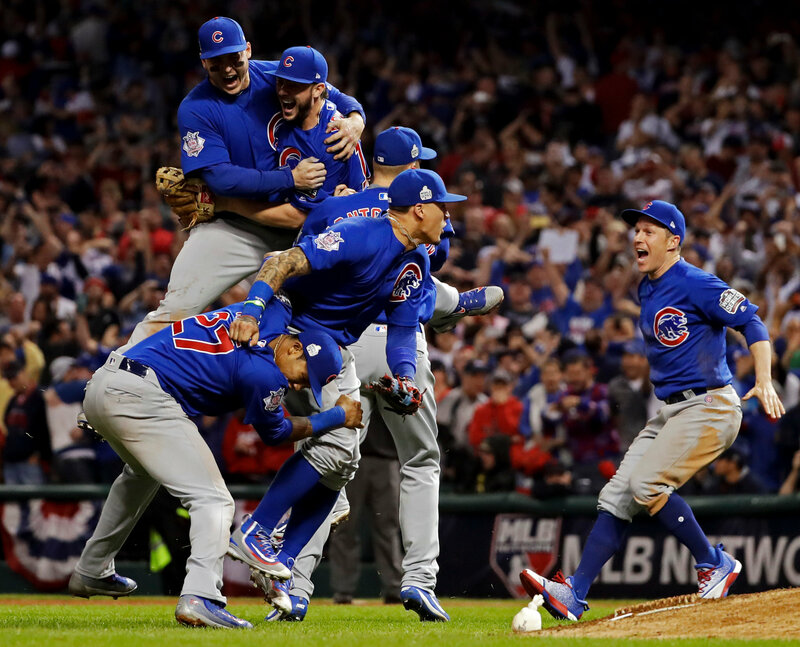 On Wednesday night, the Chicago Cubs beat the Cleveland Indians in 10 innings to win their first World Series since 1908. After falling behind 3-1 in the series, the Cubs rallied to take three straight, including two in Cleveland. Cubs outfielder Ben Zobrist was named Series MVP after tallying a .357 batting average while slugging .500, highlighted by a double in the 10th inning of game seven that drove home the go-ahead run. Cubs closer Aroldis Chapman struggled in the decisive game seven, but nonetheless picked up the win. Kyle Hendricks and Jon Lester shouldered most of the pitching duties for the Cubs, with Hendricks allowing one earned run over the first four-and-a-third innings of work, and Lester relieving him. Lester worked into the seventh and also allowed one earned. After Carl Edwards Jr. struggled to open the bottom of the 10th, Mike Montgomery came in to record the final out, a groundout by Indians’ utility man Michael Martinez. Centerfielder Dexter Fowler opened the game for Chicago with a leadoff home run off Indians’ ace and Cy Young candidate Cory Kluber, the first-ever leadoff home run in a World Series game seven. The Cubs opened up a big lead in the middle innings. Willson Contreras put his side up 3-1 in the fourth with a double that drove home Zobrist. Second baseman Javier Baez took Kluber deep to start the fifth, and Anthony Rizzo later singled home Kris Bryant to open a 5-1 lead. The Cubs took a 6-3 lead into the bottom of the eighth inning, following a homer by 39-year-old catcher David Ross in his final MLB at-bat. After an early rally, Cleveland speedster Rajai Davis drove a Chapman fastball just over the left-field fence to tie the game at six, in a moment that would have cemented him in Cleveland legend in the event of an Indians victory. Both teams were held scoreless in the ninth, sending the contest to 10 innings after a brief rain delay. With Albert Almora Jr. on first and Rizzo on second, Zobrist drove an offering from losing pitcher Bryan Shaw to left, scoring one. Miguel Montoro later singled to make the game 8-6 before Baez flew out to end the inning. In the bottom of the frame, Edwards Jr. brought the Cubs an out away by striking out Mike Napoli and forcing a groundout from Jose Ramirez. However, Davis again played hero with a single that drove home Brandon Guyer, who had walked. After the hit, Edwards Jr. was pulled for Montgomery. Martinez dribbled the second offering from Montgomery to Bryant, who visibly grinned as he fired across to Rizzo well in time for the out and the win. Chicago is the first team to overcome a 3-1 World Series deficit since the 1985 Royals. After splitting the first two games in Cleveland, the Indians took the first two games at Wrigley Field to open a commanding lead. Their pitching was nearly untouchable, with Kluber and closer Andrew Miller stifling Cub bats at historic levels. In game seven, the star duo allowed six earned runs over six-and-a-third innings. “It happened: @Cubs win World Series. That’s change even this South Sider can believe in. Want to come to the White House before I leave?” President Barack Obama tweeted. LeBron James, Bill Murray, and other celebrities were on hand to watch the historic and much-anticipated matchup. Murray, a high-profile Chicago fan, was found celebrating in the Cubs clubhouse with the team, champagne in the air and in the eyes. “I knew I was going to cry, I didn’t think it was because I was blind,” Murray said. Both sides were remarkably young, particularly for World Series qualifiers. Bryant, Addison Russell, Kyle Schwarber, and Baez highlight a core of stars under 25 years old. President of Baseball Operations Theo Epstein, who broke the Red Sox World Series curse in 2004, has broken another curse and cemented his legacy as a Hall of Fame executive. Cubs General Manager and Wes alum Jed Hoyer ’96, a crucial player in assembling Chicago’s roster, takes home his first world series trophy as a GM.